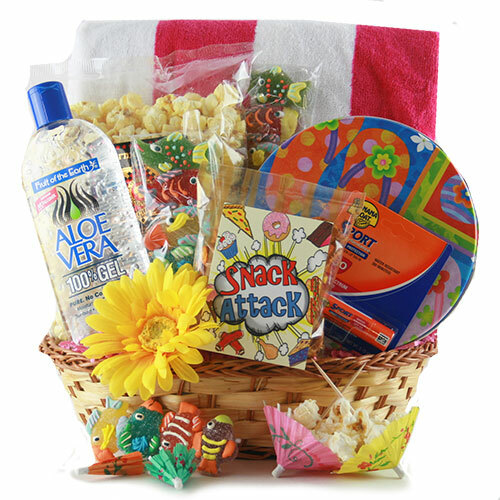 Creative gift wrapping ideas can enhance all the time and effort you have put into choosing the perfect gift. You can always use traditional wrapping paper, but there are so many other choices. So, let's wrap! How do I decide on creative gift wrapping ideas? Imagine how you'd like your gift to look. You can get inspiration from your theme, the bride's taste, bridal shower colors, or the gift itself. What are my choices of containers for the gift? • Paper boxes: These are the shirt, tie, lingerie and dress boxes we're all used to. Made of thin cardboard, they come in a variety of shapes and sizes. They are inexpensive, and easy to wrap and decorate. • Decorative wood boxes: these come in all different sizes from mini to large. Some are bought unfinished, then painted, decoupaged, or stenciled. Finished versions come painted or stained, with various designs. These become part of the gift, as they can be saved and used. • Gift bags are very popular. Made of paper, they are relatively inexpensive, and easy to use. They come in different shapes, sizes, and colors. Fabric gift bags are often sold in the size to fit a wine bottle. However, if you know how to sew, you can easily assemble a bag from material, in any size you need. This can also be kept and reused. • Photo boxes: These sturdy cardboard boxes are sold in a variety of colors and designs. Intended for photos, the bride could also store her bridal shower cards in these, turning this creative gift wrapping idea into a keepsake. What can I use besides traditional wrapping paper? Creative gift wrapping ideas show that extra thought and time was put into your gift. The following items are usually inexpensive. You may even have some of these sitting around your home. • What are some of the ways I can use these creative gift wrapping accents? Cut ribbon to go around the package horizontally. Glue strips all the way down the package, leaving 1" space between each strip. Add a coordinating ribbon bow to the center. 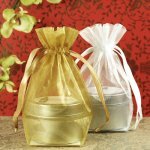 • Nature gifts: If you're giving an outdoor or country style gift, adding raffia will enhance the look. Tie it around the gift, and add a material bow. • Greeting cards are sold on every subject. Find one that gives a hint about your gift. Glue it to your package and frame it with strips of ribbon. • Doilies can be used underneath a card or flowers. This creative gift wrapping idea gives a romantic look. • Silk flowers: use one large or several mini ones, and attach to the top corner, or center of the box. • Buttons: If the guest of honor is a crafter, a small bagful of buttons, tied with ribbon can be added to the present. • Tassels can be added to the handles of a fabric gift bag for an elegant look. • Seashells glued to your gift, will reinforce a beach theme bridal shower. • Small kitchen items such as teaspoons or a whisk, can be tied with ribbon, and added to your kitchen shower gift. • Mini craft figures: craft stores carry every miniature imaginable. Find some that go along with the theme. • Small picture frame: insert a picture of you and the bride-to-be in a small frame. Place on top of package. *** Creative gift wrapping ideas are a fun part of planning for the shower. Once you start brainstorming, you'll come up with many of your own ideas. • Do you need some gift ideas? • Go from gift wrapping page, to Bridal Shower Ideas For You homepage.